Discover a slower, more relaxed way to spend your holiday with slow travel specialists Inntravel. Last weekend, I traveled down the M6 to Cheltenham Racecourse to attend the 2017 Inntravel Discovery Day. This is an event held every three years by the slow holiday specialist Inntravel, and has been described as a ‘living brochure’. During my visit, I learned about the beauty of taking things a little slower when you go on holiday. I also listened to a fascinating talk by BBC presenter Kate Humble, who shared some wonderful Slow Stories. My visit gave me new inspiration for travelling in ways that I hadn’t considered before. 1 What is Slow Travel? Many holidays fall into two distinct camps. They tend to involve either packing in as much activity and sightseeing as possible, or doing as little as possible. My holidays definitely follow these patterns so I was intrigued by this third alternative: slow holidays. Slow holidays offer time to relax and breathe in the experiences you enjoy on your holiday. It might involve a walking holiday, getting on your bike for a cycling holiday, or maybe a carefully planned train route. You can take in the scenery, meet the local people and experience a little of the local way of life. It’s a more authentic way to learn about a new location. Inntravel are experts in providing slow travel holidays, with over 30 years’ experience in the industry. They plan their holiday itineraries meticulously and build strong relationships with the hoteliers they work with. This means you benefit from expert advice both before and during your slow holiday. But slow holidays aren’t just for the super fit. The Inntravel range of self-guided walking and cycling holidays are suitable for even very occasional walkers. And don’t worry about lugging around a heavy rucksack. Your luggage is transported ahead to your next welcoming hotel, ready for your arrival. You probably know Kate Humble from BBC programmes like Springwatch, but she’s also a big fan of slow travel. It was really fascinating to hear Kate talk about exploring Cuba by bike, or walking the length of the Wye Valley with her sheepdog Teg. She explained how travelling at a slower pace allows you to really connect with your surroundings. But I was really inspired by hearing how Kate really took to cross-country skiing on an Inntravel holiday. I’ve wanted to ski for years, but I also find the thought of downhill skiing terrifying. But Kate explained how you can pick up cross country skiing in a matter of hours, and now I’m really keen to give it a go. This cross country skiing holiday in Switzerland sounds perfect for someone like me. You get skiing tuition, accommodation in a 4-star hotel and delicious food from an excellent chef as well. You can even catch the train back to the hotel if the skiing gets too tiring! Of course, slow travel goes hand in hand with slow food. So I was very happy to see that each stand had brought along some delicacies from home. I happily tucked into the turkish delight on the Turkey stand, as well as a beautiful Parmesan and succulent Parma Ham on the Secret Apennines stand. I also had a sip of a delicious chocolate rum drink on the Madeira stand, that’s definitely somewhere I’d love to visit! The Greek stand was laden with a wide selection of food to try, including a delicious fig cake. But as I had driven to Cheltenham, I left the ouzo and kumquat liqueur to the other bloggers. Then you would love the Inntravel Discovery Day! The friendly and knowledgeable staff from Inntravel’s partners covered countries from Italy to India. Their expert knowledge and passion for their destination gave visitors to the event a real taste of the location. 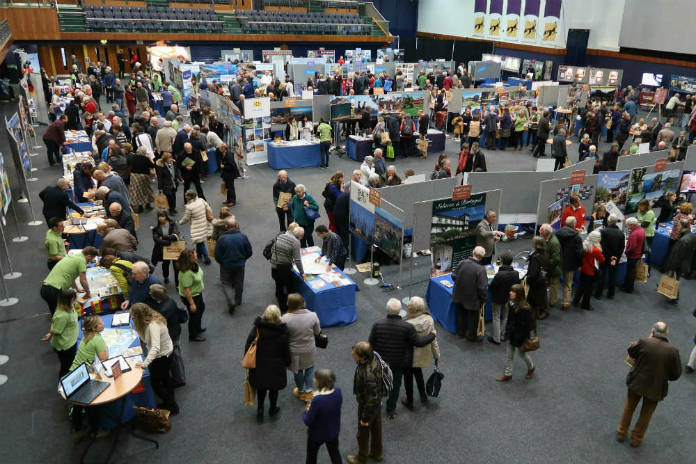 The exhibition hall was soon full of people eager to learn about slow travel, and planning their next trip. Here are some of my highlights from the show, which might help you plan your next slow holiday. As you can see, the room was packed for the talk on the Canary Islands. You might think that you already know about this popular holiday destination. But away from the beaches and nightlife of Lanzarote and Tenerife, there’s a whole different side to the islands. They are full of boutique hotels, delicious food and dramatic scenery that is begging to be explored. For example, did you know that goat’s milk and cheeses are a speciality on Fuerteventura? Or that there are sacred ancient sites to be found when you explore the mountainous region of Gran Canaria? And the stunning views on La Gomera need to be seen to be believed! Each of the seven Canary Islands has its own particular charms, and I was particularly drawn to the smallest island, El Hierro. It used to be the point that marked the end of the known world, and promises tranquility as well as dramatic landscapes and welcoming hospitality. Until last weekend I’d never heard of the island, but now I’ve got this walking holiday on El Hierro bookmarked for the future! A little closer to home, and certainly more accessible than El Hierro, Normandy is another great location for a slow holiday. Of course, there’s lots of history in the area, from the Bayeux tapestry to the Normandy landings of WWII. And for foodies, it’s a wonderful place for a holiday. Normandy is home to Camembert, Isigny cream, apple sherry, calvados, and of course moules frites. There’s even a scallop festival to visit if you plan your holiday in the autumn. I would love to visit Mont Saint-Michel, which has always seemed like a magical place, cut off from the world when the tide gets in. Alison, in the photo above, is absolutely passionate about Normandy and she shared a useful tip with me. In summer, time your visit for the evenings when most people are leaving the Mont, and you’ll have the place almost to yourself. This area of France is perfect for exploring on a bike. It’s mainly flat so you don’t need to be Bradley Wiggins to go on an Inntravel cycling holiday in Normandy. I haven’t ridden a bike for around 30 years, but watching Alison’s video really inspired me. This cycling holiday looks perfect for me – I’ve just got to convince Mark now! Although I’ve been to the Algarve and Estoril areas of Portugal many times, I’ve never explored the North of Portugal at all. But after listening to the Count of Calheiros speak at the Inntravel Discovery Day, I’m really keen to visit the Minho, Portugal’s North-Western corner. This area of Portugal is where the delicious vinho verde is produced. Inntravel take their guests to the Minho to enjoy gentle walks amongst pretty towns, nestling among the vineyards. Historic manor houses stand along the route, and these holidays have breathed new life into these historic building. The Inntravel Manor Houses of the Minho holiday ends at the Count of Calheiros’ own estate. It’s a relaxed way to discover an area of Portugal that you might not have visited before. And you could easily combine this break with a few days in Porto, to discover the home of port wine. I left the Inntravel Discovery Day feeling really enthusiastic and inspired about slow travel. It isn’t something that I’d really considered before, but I love the idea of getting to know a location at a less hectic place. If you would like to know more about slow travel, visit the Inntravel website for further information or to book a holiday.